SHE’LL BE BACK for Terminator 4 : Terminator Salvation. We first heard inklings of this in January and now SciFi has some confirmed sources saying its done. Linda Hamilton’s voice will be used in the film – not sure if this will be an Obi-Wan Kenobi thing talking to John Connor – or more of a flashback life lessons thing – but it’ll be there. This is John Connor. If you’re listening to this you are the resistance. This trailer offers a whole lot more insight into the movie than we’ve seen yet ..with a decent soundtrack from Nine Inch Nails to Boot. If you need any more proof that the current Sarah Connor Chronicles is Frakkin crap – here’s some. 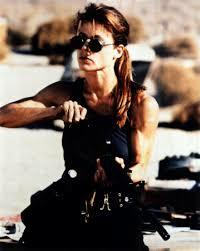 Linda Hamilton – the one, the only – THE TRUE SARAH CONNOR – is likely to have a cameo in Terminator 4 – Terminator Salvation. Oh and Christian Bale. Unlike the whimp on Sarah Connor Chronicles Bale is a DuDe that is entirely believeable as a leader among men. The first teaser trailer for Terminator 4 – officially titled Terminator Salvation and it looks great (what trailer doesn’t though right??). Batman himself – aka Christian Bale – looks every bit the role as John Conner. Not much in the way of Skynet in the trailer just a lot of cut scenes and what looks like an HK – hunter killer – craft at the end. Still…it’s sweeeeeeeeeeeeeeet to see the first real glimpses of this movie that should come out at almost the exact same time as Star Trek XI. 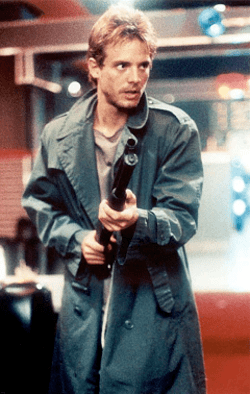 I remember the first vision of the post Judgment Day world…from the original (and still the best) Terminator. Reese and the resistance were fleeing from the HK’s – the hunter killer flying machines that Skynet deployed to destroy the resistance. 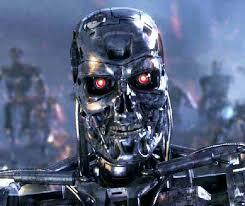 No word yet on whether or not the HKs will be in Terminator 4 – but we will see some other Skynet human hunting tech. Filming is now in full swing for Terminator 4 officially known as: Terminator Salvation : The Future Begins. Everything we’re shooting is designed to be tactile and real, you’ll be seeing a whole set of inspired designs you’ve never seen before, and best of all you’ll finally get to see some of the post-judgment day future that was only hinted at in the previous movies. Let’s all be honest here – T3 sucked. In the highly anticipated new installment of The Terminator film franchise, set in post-apocalyptic 2018, Christian Bale stars as John Connor, the man fated to lead the human resistance against Skynet and its army of Terminators. But the future Connor was raised to believe in is altered in part by the appearance of Marcus Wright (Sam Worthington), a stranger whose last memory is of being on death row. Connor must decide whether Marcus has been sent from the future, or rescued from the past. As Skynet prepares its final onslaught, Connor and Marcus both embark on an odyssey that takes them into the heart of Skynet’s operations, where they uncover the terrible secret behind the possible annihilation of mankind. It looks like there could be as many as three new Terminator movies in the works — all focussed on humanity’s leader John Connor beating the machines led by SkyNet. According to the BBC, Christian Bale (who has already signed up for Terminator 4: Terminator Salvation: The Future Begins) has actually signed up for three Terminator films. So we’ll have a T4, T5 and T6. T4 is currently set for release May 22, 2009. May 22, 2009 is now set as the release date for Terminator Salvation: The Future Begins. If that date sounds familiar..you’re right ShowMeSciFi.com fans. That’s right! It’s just about the same time as Star Trek XI. So it’ll be a SciFi shootout Memorial Day Weekend in 2009. T4 begins two months of production in New Mexico on May 5. While there is alot of hype now surrounding the official broadcast date of Terminator: Sarah Connor Chronicles (where is Linda Hamliton!!!) the real show is set for 2009 with the release of Terminator 4. Finally we’ll see the battle btwn man and machine the true battle of the future. It’s now been confirmed that Batman Begins star Christian Bale will take on the role of John Connor. Producton is supposed to start in late April of this year. The name of the film?